Which Museums in Krakow are Worth Visiting? Which museums in Krakow deserve to be placed in the sightseeing program? Well, to be honest, there is so many fascinating exhibitions in the city that is really hard to choose only some of them. Certainly it is good to start with checking the websites of the National Museum in Krakow and the Historical Museum of the City of Krakow. Both of these institutions have many departments and offers plenty of interesting exhibitions. In all our articles we try to emphasize that the Kraków tour should start with the Rynek (‘Main Market Square’) Underground Museum (independent Historical Museum department that was described in another post – we offer a guided tour through the exhibition with one of our experienced guides). Then we propose to step into the Historical Museum main building in Krzysztofory Palace. You can see there an excellent virtual model showing the reconstruction of Kraków buildings and urban layout in different eras. The show ‘Cyberteka – Krakow: time and space’ has been prepared by animation specialists. Watching it will completely change your perception on today’s Krakow. You have already a chance to know from our previous articles about the Eagle’s Pharmacy at the Ghetto Heroes Square. We have written also about the Old Synagogue and the Schindler’s Factory. So take route dedicated to the tragedy of Kraków Jews during World War II and you will have the unique opportunity to see all three departments of Historical Museum mentioned above. And have you heard about Hipolit House? (and the famous cat called ‘Hipolit’?) It is located near St. Mary’s Church (Marienplatz 3) and entirely dedicated to the exposure presenting the interiors of bourgeois homes from the 17th to the 19th century. Visiting it is a great opportunity to see original, beautiful furniture and a lot of great, historic spaces (eg. the 19th-century ladies room or office of 17th-century burgher). Highly recommended! We also encourage you to read our post dedicated to Krakow exhibitions related to World War II (especially in the Historical Museum department in Pomorska Street, the former Gestapo prison). In the main building of the National Museum takes place a very interesting temporary exhibitions (just to mention a brilliant one devoted to the Stanley Kubrick’s films!). It is always good to check what is presented actually. Meanwhile, you can see three permanent exhibitions presenting the museum’s collections in the area of weapons and uniforms, crafts and contemporary art. Admirers of the medieval art we encourage to visit the Bishop Erasmus Ciolek Palace on Kanoniczna St. See also the oldest museum department with Polish Painting Gallery in the Cloth Hall. There are paintings of the best Polish artist of 18th and 19th century as Matejko, Siemiradzki, Malczewski and many others. Speaking of Matejko (the best Polish historical painter), please note that at St. Florian’s Street stands a house where he lived with his family for a long time, and in the interiors of the Matejko’s House National Museum arranged a great exhibition dedicated to his life and work. Equally interesting is the Mehoffer’s House in Krupnicza St. with great, largely original interior (its former owner Józef Mehoffer was a great representative of Krakow Art Nouveau). The most valuable examples of European painting collection are presented in ‘Europeum’ (the Centre of European Culture), a department located in the 17th-century granary at Sikorski Square. You can see there works of such great artists as Peter Breughel the Younger, Paolo Veneziano or Bertel Thorvaldsen (just a few from many names). You should also visit the nearby collection of Emeric Hutten-Czapski placed in in his former palace, located on Pilsudski St. (Czapski collected primarily stunning coins and historical books). His 19th-century collections are dazzling, but we should visit the palace because of the way of arranging exhibitions – décor refers to the time of the first owner! Ancient Egypt, Greece and Roman Empire fans will be delighted by the exhibition of ancient art, probably the best in Poland, available in the Czartoryski Museum. 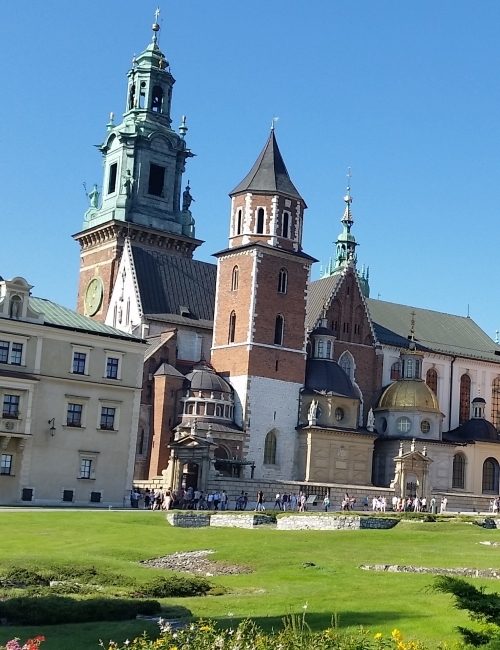 Visiting various museums in Krakow, do not forget to step into the Treasury of the Kraków’s Cathedral on Wawel Hill! You can see there not only great examples of sacred art, but also the famous medieval copy of St. Maurice spear, offered to Boleslaw the Brave by Otto III during the Congress of Gniezno (Anno Domini 1000!). Wawel Castle Museum and its magnificent collections do not need special advertising. Just remember that at the time of repair Czartoryski Museum Wawel Castle takes care of the famous Lady with an Ermine by Leonardo da Vinci. Art, history… maybe a little bit of archeology? We like very much also the interesting exhibition in the Archaeological Museum – this is a really great reconstruction of the prehistoric times in Krakow area. Surely this is another place where your children will be delighted! You can see eg. a life-size mannequins presenting the appearance of the former inhabitants of Lesser Poland in different eras with costumes, jewelry, tools which they used and the reconstruction of their houses. The original findings and digital presentations remind us the way of life in past, how people was hunting or what they ate. Here is also the exhibition dedicated to ancient Egypt (Mummies! There are mummies!). Fans of Japanese culture will be delighted in Museum of Japanese Art and Technology ‘Manggha’. Just check out its website and see what currently exhibition they actually presen and then go to this well designed, modern building located on the Vistula river bank, opposite the Wawel Castle. Museum foundations are set up on wonderful collections of Feliks Manggha Jasieński, another Krakow collector, who amassed a numerous magnificent Japanese woodcuts! Recommending the best museums in Krakow, we could not forget to mention the Aviation Museum located in the former Czyżyny Airport (one of the oldest airports in Poland!). Collections and its presentation are really fantastic. Enthusiasts will be literally ecstatic! Except Schindler’s Factory Zabłocie district offers the Museum of Contemporary Art ‘MOCAK’. It is an excellent proposal, both for those who are fascinated by contemporary art, as well as those who are completely unconvinced to it. MOCAK aims eg. taming of the follies of contemporary artists (and maybe it turns out that they are not that crazy?). We add that the museum building itself is worth seeing because of the unquestionable architectural value. It is also worth mentioning that Zabłocie is a unique district – former industrial area now annexed by cultural institutions and various types of thriving initiatives (as well as all the attractive areas for house developers). This is another place where you can see a lot of great Street-Art realizations. Then Street-Art trail (we have it in our offer) allows you to look at the city from a different perspective. Oprowadza po polsku. I robi to perfekcyjnie – z pasją i energią. Będzie absolutnie przeszczęśliwy mogąc odpowiedzieć na Wasze pytania. Im więcej mówi o swoim ukochanym Mieście, tym jest szczęśliwszy.